It is 2017. The only certainty is that the six has changed to a seven. In the new American political climate, where a reality TV star is president of the United States and the tension resulting from police shootings here and across the nation remains high, no one can be sure of what this year holds for Charlotte. One thing that has been demonstrated in the past, however, is this: When cultural shifts occur and ambiguity looms, art scenes explode. New works push unspoken conversations to the tips of tongues. Visual, performance and sonic arts imbue cities with multi-hued perspectives, peppering everyday conversations with necessary discomfort. Those works engender a state of collective mental dissonance that provokes people to speak out. At the tail end of 2016, images on 24-hour news networks painted Charlotte as a city in distress, burning with anger and hate. But the state of Charlotte, like that of cities across the nation, is much more ambiguous. In a post-Keith Lamont Scott environment fraught with pro-Trump/anti-Trump rhetoric, Charlotte's artists are providing multiple and varied narratives that reveal a more nuanced and complex city. And the characters and settings of those narratives involve much more than just bankers, religious icons, sports arenas and NASCAR. 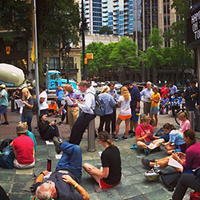 The talented activist-artists popping to the surface in Charlotte today are pushing the city's collective mental dissonance to the edge, serving as catalysts that may help to transform polite surface conversations into uncomfortable debates of depth and a yearning for true understanding. Creative Loafing has connected with five activist-artists — visual artists to facilitators of conversations to a pair of promoters who create escapist shelters from the storms. We believe you should get to know these people in 2017. Art Theme: Finds the magical realism in social unrest that points to injustice. Marcus Kiser lumbers across the maple syrup-colored wooden dance floor of N.C. Music Factory venue The Underground, moving in a slow, methodical Snuffaluffagus-like manner as he makes his rounds of "hellos" and hugs. 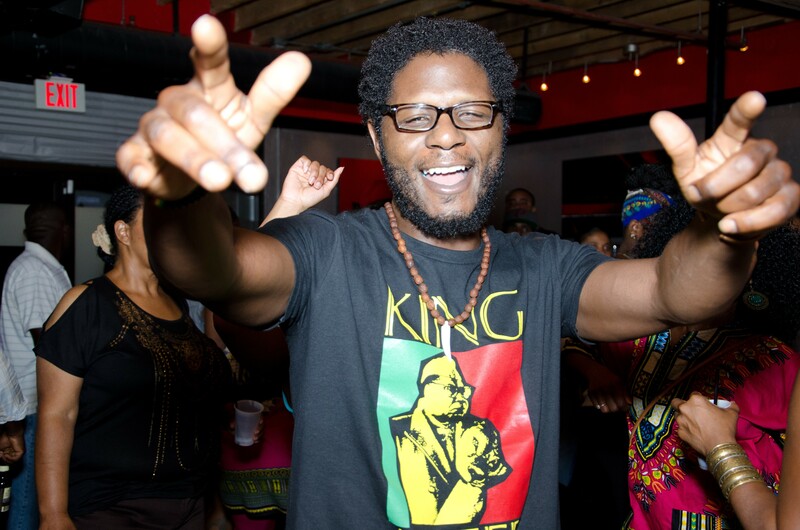 Kiser sees familiar faces at the Gantt Center's Heritage & History event "The Hip-hop Fellow." Before the lights dim and the flicker of the film begins, Kiser enjoys moments of small talk with several Charlotte hip-hop influencers who are making their way to their seats. The attendees have convened in front of a pop-up movie screen to watch the tale of the Grammy-winning producer, DJ and record executive Patrick Douthit, better known as 9th Wonder, and the North Carolina artist's journey to becoming a Nasir Jones Hip-hop Fellow at Harvard University. Kiser, like all of the attendees, is inspired. For him, that inspiration manifests itself as art. Kiser is a graphic designer who works in the Afrofuturism style that arose in the 1990s and combines elements from science fiction, historical fiction, fantasy, Afrocentrism and magical realism. Most works of Afrofuturism are critiques that showcase dilemmas people of color experience on a daily basis, as well as revisiting and revising the social justice issues people of color have experienced throughout history. Kiser's work draws on themes and images from Marvel Comics, Image Comics, and video games. The messages that he and his creative partner Jason Woodberry have produced have earned them an artist-in-residency at the McColl Center For Art + Innovation. The two have showcased their Intergalactic Soul collection at the Harvey B. Gantt Center for African-American Arts + Culture, Art Basel Miami Beach, Fla., and on ArtPop billboards around Charlotte. For Kiser, the Keith Scott shooting on Sept. 20, 2016, marked a historical turning point in race relations in Charlotte. "These things have been happening for decades. It's not new," Kiser says. "It's not even new to Charlotte. We can't expect the community not to react to the negative actions that have taken place. In any action, there's always going to be a reaction." 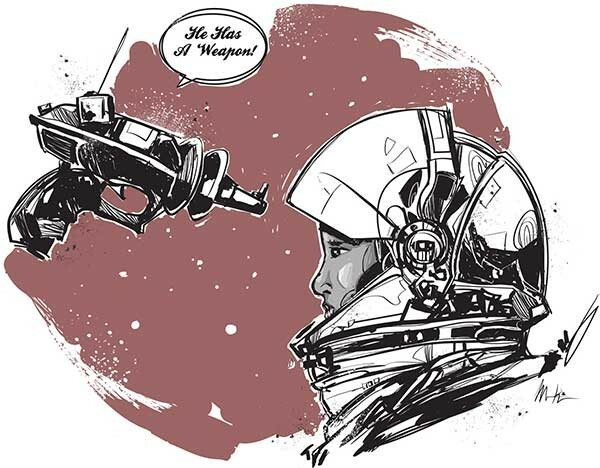 Even before the shooting, Kiser had begun putting the ambiguity of the frustration, anger, pain and yearning people of color feel into works such as "I.Matter," which depicts an astronaut floating in space with the words of the title in a dialogue bubble above his helmet. "People really want to believe in an equal and just system, but the system has led them to have so many trust issues," he says of the post-Keith Scott uprising. "So with that understanding, I'm not surprised at the protests and the community's reaction." The work Kiser and Woodberry had produced before the 2016 uprising has taken on deeper relevance today, resonating with audiences that may not have connected to it prior to the protests and recent presidential election. "Intergalactic Soul isn't directly tied into the Keith Scott shooting," Kiser says. "However, it covers multiple social issues and topics, including many of the recent police shootings [in other cities]." His and Woodberry's goal, Kiser says, was to create work that would start serious conversations about positive change. See the work of Marcus Kiser, Jason Woodberry and additional artists at the McColl Center for Art + Innovation (721 North Tryon St.) from January 27 to March 25, 2017. Art Theme: Facilitates discussions about art, criticism, diversity and social change. "Hey, Manoj," an excited voice calls from across the room following the Charlotteans of the Year Awards Luncheon at the Omni Hotel in December. For most people in attendance, the event is over and they're filing out of the dining space to finish up their workdays. But Manoj P. Kesavan has just jumped into his stride, working the room like a champ. Kesavan's large smile cast his bright white teeth against a thick, jet-black mustache and goatee as he greets the caller from across the room, his arms spread wide. After a friendly embrace, the two share updates about projects and coordinate a time to continue their catch-up conversation over coffee. A self-described introvert who acts like an extrovert, Kesavan goes through that same process several times before he finally makes his way out of the hotel. After all that activity, he has pushed his energy threshold to the max and needs time to recharge. Luckily, the silver-haired creative's favorite one-on-one meeting spot — a familiar breezeway in Uptown — is not far away. When we arrive there, Kesavan pulls one of the retro, '60s-style chairs to just the right vantage point and plops down. His eyes become transfixed on the buildings beyond the breezeway glass, and with an accompanying sigh, he says in his waning South Indian accent, "Charlotte architecture is always the same. No visual creativity." Kesavan has earned the nickname of Cultural Catalyst for good reason. Since he arrived in the Queen City in the early 2000s, the architect-turned-rogue arts organizer has pushed, confronted and contributed to the city's arts community and institutions year after year. From his Point8 art meet-ups to his one-time blog at Creative Loafing, Kesavan has tirelessly encouraged the art of "the critique" in Charlotte. Kedsavan's Que-OS forums for artists and art lovers encourage attendees to form distinct opinions that are untainted by city or corporate boosterism. After 16 volumes of his Pecha Kucha Charlotte events, Kesavan recently added the fringe art festival BOOM Charlotte to the mix. His mission: to build a more inclusive arts scene by bringing people of all backgrounds together in one space and encouraging totally open dialogue. When the police shooting of Keith Scott led to an uprising that occurred squarely in front of the Omni Hotel, where Kesavan had just attended the awards luncheon, it solidified for him the need for even more dialogue about social issues through art. "The Keith Scott incident was very sad and disturbing, but not surprising," he says. "It was only a question of when the unrest in Charlotte would reach a breaking point, and it finally happened during the protest." Kesavan was one of the first arts organizers to answer the call. "The incident, and everything that followed, has given a whole new direction to the Pecha Kucha Nights," he says. The Que-OS team put out a call for artistic responses to what was happening in Charlotte, and Kesavan says he was "humbled" and "overwhelmed" by what came in: 18 additional presentation submissions within a three-day turnaround. "In a city still coming to terms with the recent happenings, it feels like we [Que-OS] have become the unlikely 'First Responders' of the art scene," Kesavan says. "And in a place which suffers from a lack of trust, we are grateful for the trust that diverse creatives have placed in us as a safe and welcoming place for their voices to be heard." Look for those new voices at Que-OS's second fringe arts event: the BOOM Charlotte Festival in Plaza Midwood, April 28 - 30. Art Theme: Creative events designed for artists and art lovers to mentally recharge. Noele Lofton has her clipboard in hand. The darkened room illuminates in pulses as stage lights transition from one color to the next. She shows the clipboard to her partner Leara McKinney and points to something on it. McKinney nods as she makes her way to the stage to greet the crowd. The energy is high inside the Dirty Hippie on a cold February night. People are Milly Rockin' with Chris Brown Dance Crew precision as the DJ plays turn-up hip-hop between each local act. Colorful painted bodies navigate through the dancers as art vendors log sales in Charlotte's new cultural underground oasis known as the UrbanZüe Art Gallery, Lofton and McKinney's imaginative, multi-disciplinary arts event. This event, on Feb. 5, 2016, was the duo's second go-round as ringmasters of their burgeoning brand. After years of networking, the two created a space where Charlotte street artists and the alternative urban music crowd are able to find others who share their look, sound and ideals. McKinney calls it "a big giant network party." 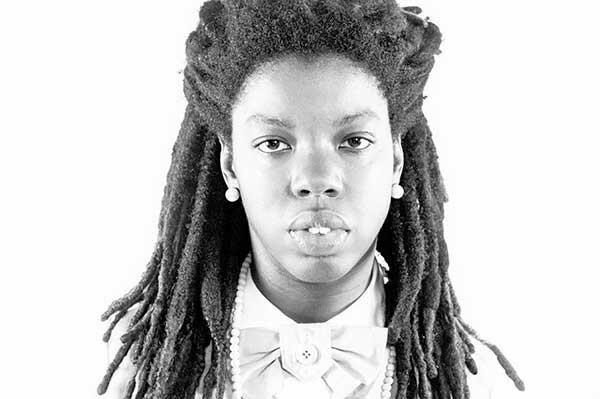 McKinney, better known by her artist moniker Loude Züe (pronounced similar to Chinese philosopher Lao Tzu's name), and Noele Lofton, who goes by Züe Möe, are leading a millennial arts collective whose aim is to spread the principles of peace, love, unity and collaboration among Charlotte's emerging young artists demographic. Loude Züe and Züe Möe started UrbanZüe strictly as a graphic tee line with witty Afropunk-esque commentary screen-printed onto fabric. The clothing line evolved into hosting arts and culture events they call UrbanZüe Art Gallery. The idea was to create a space where visual artists, musicians and professional dancers could showcase their arts and network with one another. 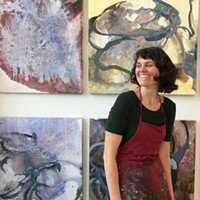 After graduating high school in Charlotte, Loude began focusing on visual arts and Möe on sonic arts. Being young newbies trying to find their way into Charlotte's arts and music scenes seemed impossible. So they decided if they couldn't find the scene they were looking for, they would create it. They began networking with other creatives one-on-one, bartering talents and cross-promoting events to get projects done. "We have been meeting with bloggers, writers, visual artists, musicians and everybody creative," Loude says. "That is why this party — this show that we throw — works." The two would like for UrbanZüe to serve as an alternative to the way people reacted during the protests after the Keith Scott shooting. The hard line drawn between Charlotteans was filled with potent "us vs. them" rhetoric, and Loude says that was needed because it had taken Charlotte such a long time to react in a loud and public manner to such incidents. But the most powerful part of the protest, for Loude, was being a part of a collective of millennials with a shared ideal of marching through Uptown. Now, she says, it's time to nurture and channel that energy. For Loude and Möe, UrbanZüe is about bringing together young creatives who share the urban hippie ideals of love, peace and unity. And they do it by proving a space where artists can share their work with the community and collaborate on future projects. "UrbanZüe events promote staying positive in the community and reminding people we have to stick together and uplift the community through the arts and by sharing our talents," Möe says. The first UrbanZüe Art Gallery after the protest was the Big Chill, a '90s-themed party focused on creating joy. There were bubbles, balloons, hula-hoops and dance-offs. 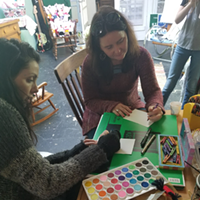 The next event happens this spring, and the two plan more initiatives throughout the year, including Vandalisa, a mobile art gallery packed into a retro van that will bring art to a neighborhood near you. Art Theme: Designs walking billboards with "cool and conscious" messages. Eric B. Ndelo exudes confidence and positive energy as he makes new connections on an early first Friday in August. He's at a Creative Mornings Charlotte event, his hands and arms moving in grand gestures as he explains to networking peers the social and global mission of his lifestyle and fashion brand DRC ApeParel. You don't even need to talk to Ndelo to know his spirit is warm and welcoming. His body language says it all. Although Ndelo was born and bred in Charlotte, when you hear the depth of his passion as he talks about the Democratic Republic of the Congo (D.R.C. ), you'd think he was a Congolese native who recently relocated to the Queen City. Ndelo's knowledge of his family's hometown of Kinshasa, in the D.R.C., is extensive. The pride he has for his African heritage is immense. But it's the heart he puts into educating others about "the Africa not seen on TV" that really shines. Ndelo's mission is to use street fashion to spread knowledge and raise awareness about the issues and injustices happening in the Congo and in Africa at large. The motto of DRC ApeParel is, "We are the Cool and the Conscious." The road to Ndelo's discovery of that consciousness — knowledge of self — was bumpy. If you had met Ndelo when he was in the third grade, you would have found a young Congolese-American boy born in the red, white and blue, and wishing to be seen only as Eric B, not Eric Bitisu Ndelo. In a Congo Live podcast, he recounts his grade-school days and the moment when his African shame became African pride. "I wouldn't even write my last name," Ndelo says in the podcast. "Which is crazy because now I prefer to be called by my last name." 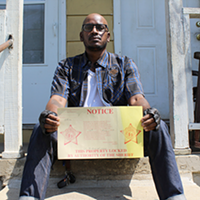 He continues: "One day I came home and my father saw my paper. He said, 'Hey, who is this Eric B.?' I said, 'That's me.' He said, 'No, your last name is Ndelo.'" His father scolded him and told him the story of his last name and why he should be proud. His Congolese heritage, his father said, "makes you unique and will help you strive to be better while living in America." During his process of self-discovery, Ndelo learned about his homeland, experienced moments of wonder and excitement that came with the "beauty and the depth" of the history of the Congo and the continent of Africa. The more he learned, the more he wanted to share it with the world. After a trip to Paris, he discovered an artistic medium that would help him do that: graphic tee and couture fashion. Ndelo created DRC ApeParel in 2004, and his street-fashion style has expanded in Charlotte, especially since the Keith Scott shooting. People searching for ways to express their opinions about social issues see Ndelo's fashions as the perfect medium. One DRC graphic tee is the "Guerrier Léopard" (Leopard Warrior) Collection inspired by the rise in coverage of police brutality that ignited the #BlackLivesMatter movement. That series, Ndelo explains, "showcases the spirit of the Batetela youth in the province of Kasai-Occidental [in the D.R.C.] that rose up and have become the protectors in defending the rights, culture and land of the people of Congo." Ndelo sees the uprising of Congo youths as very much like that of #BlackLivesMatter: Young, black millennials who use smartphones and social networks to become protectors, holding those in power accountable. For Ndelo, that means broadcasting messages that question those in power not only digitally, but also in the actual world. "With DRC ApeParel," he says, "you as a person become a walking billboard of the consciousness you want to help others wake up to." Art Theme: Protests injustice through musical. LaShanta Richardson's dreadlocks swing from side to side as she scurries to the other end of the John Paul Lucas Room at the University of North Carolina at Charlotte. She has been working on a second fundraiser concert for the Keith Scott family over the past couple of months. After booking the dates, pulling in volunteer event coordinators and promoters, and finding musicians willing to donate their time, everything needs to flow like clockwork as it always does during Richardson's many UNCC student-organized events. As the primary point person and organizer of the #SAYHISNAME concert, Richardson is in a rush to get to one of the event volunteers and catch them up on what needs to be done. She then heads to the stage to introduce a student who is new to live performance. "OK, everyone," Richardson announces, "put your hands together as we welcome Open Eyes to the stage!" Richardson has been holding her own in North Carolina's hip-hop scene since 2011 as La La Specific. But as LaShanta, she was raised to be an organizer. Before hip-hop was even a part of her music-listening repertoire, Richardson's parents were teaching her the core values that they lived by. "My mom instilled in me that love conquers all," she says. "Both my mother and father taught me to care about others. Music became my way to teach this to others." With those values a part of Richardson's DNA, by the time she found hip-hop as La La Specific,becoming a sonic-art activist naturally followed. Richardson was not exposed to hip-hop until 2006, when she was a freshman at Smithfield-Selma High School in Selma, N.C. It was new to her tender ears. "I grew up hearing classical, jazz, and gospel music in my house," she says. "I was not exposed to hip-hop until my ninth-grade year. That was the first time I heard Lupe Fiasco's 'Kick, Push.' I could better relate to the content he was talking about in his rhymes." Soon after falling into the sounds of Lupe, Richardson migrated from playing musical instruments to crafting hip-hop beats with her multi-instrumentalist skill set, and she became La La. Her knack for crafting beats won her an invitation to join Raleigh-based hip-hop collective The Infinite Team, now known as The Infinite Family. Her Infinite Family brother Freedom Infinite urged her to pick up a pen and move from the beat machine to the microphone stand. "In 2010, Freedom challenged me to craft my first 16 bars to the beat of Kanye West's 'Big Brother,'" La La says with a tone of pride and excitement. "People liked it and I liked the feeling of people appreciating my perspective and listening to what I had to say." A year after those first 16 bars, La La dropped a full mixtape, Sonic Boom, which told her life story. "The message I was sharing with the listener was that they should stay positive and that they can make it," she says, echoing the values her parents instilled. When the Keith Scott incident shifted Charlotte's culture, the have-nots suddenly had the eyes and ears of politicians, police, high-income folks, and decision-makers in Charlotte. The community's reaction to the shooting did not shock La La. "Because of the multiple events of police involved shootings in the U.S. that occurred prior to the killing of Keith Lamont Scott and the ongoing tension between CMPD and citizens of Charlotte, I wasn't surprised," she says. "This is also not the first time CMPD was involved in this type of shooting," La La continues. "There are two incidents in particular of the shootings of unarmed citizens that stand out. The incident of Jonathan Ferrell, in 2013, and another, in August 2016, that involved the shooting of a deaf man named Daniel Harris. For every action there is a reaction. In my opinion, the Charlotte protests were warranted and should have been expected. People are hurt and are sick of this happening on repeat with no justice or reform. What surprised me was that the city did not explode in more of an outrage. Although the national news media created a narrative that portrayed the city in shambles, it wasn't. I'm proud of Charlotte for that." While La La expected the protests to happen and feels they were warranted, she is now focused on finding ways to help the city heal. In October and December of 2016 she organized the #SAYHISNAME concerts to raise funds for the Scott family while commemorating other lives lost at the hands of the police. Now a recent graduate of UNC Charlotte with a B.A. 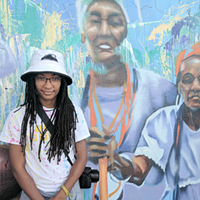 in Africana Studies, La La's plan is to share her perspective with others not only through music, but also through curricula and community organizing. She is a trained substitute teacher and will be substituting in the 14 underperforming schools that are part of the Beacon Learning Community. In addition to teaching, she will act as the community advisor for the UNCC student organization UNCC Cypher. Of all the artists to watch in 2017, La La Specific may be shepherding information to the most important group of people likely to grow and strengthen Charlotte's culture – children. And Creative Loafing will be watching and documenting her and the entire movement throughout 2017 and beyond, as more emerging creatives jump on the activist-art train in the Trump years.